A Psalm is basically a poem set to music, and sung. This sets the book of Psalms apart from other Scripture. You will find other Psalms and songs scattered throughout scripture - some are also used for worship - but they tend to be part of a narrative. Because people think of the Psalms purely as a 'song book' they have tended to overlook them as a place to look for teaching - even considered them as a less important part of the Bible.^^Yet, for many centuries the Psalms would have been the most familiar part of scripture to people who had no access to books. They are not only an integral part of the shared experience of the church but they also communicate God's guidance to this world, unfurl his character and encourage his people.^^The range of subjects covered is staggering! They extol God's greatness and invite repentance, express commitment to his covenants and adherence to his law - and look forward to the coming Messianic kingdom. The style is predominantly praise but includes prayers, complaints - and even curses! Many were composed as liturgy, to be sung by God's people together, others are private and personal - yet have still found a place as shared worship in the church.^^All of which makes them fascinating! 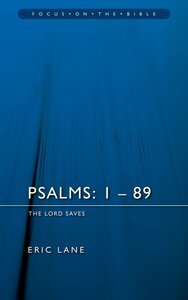 This volume covers the first 3 books of the psalms (Psalms 1 to 89). A second volume covers books 4 and 5 (Psalms 90 to 150) and includes an appendix with a suggested chronological order. - Publisher 6 women from Jesus' family line in the Bible 6 women from Jesus' family today in the Church all ordinary yet all extraordinaryMary Whelchel's conversational style honed from successful broadcasting make these stories of biblical and contemporary women linger in your thoughts bringing you facetoface with the lifechanging power of Gods grace.You'll discover that God transformed ordinary women in the past and continues to do so today. Extraordinary Women by Grace offers hope and encouragement to all women regardless of past failures defeats or missed opportunities. About "Psalms 1-89 (Focus On The Bible Commentary Series)"
6 women from Jesus' family line in the Bible 6 women from Jesus' family today in the Church all ordinary yet all extraordinaryMary Whelchel's conversational style honed from successful broadcasting make these stories of biblical and contemporary women linger in your thoughts bringing you facetoface with the lifechanging power of Gods grace.You'll discover that God transformed ordinary women in the past and continues to do so today. Extraordinary Women by Grace offers hope and encouragement to all women regardless of past failures defeats or missed opportunities. Eric Lane trained to be a minister in the Church of England where he remained for 7 years. He was then called to be the minister of an Independent Evangelical Church where he pastored for 30 further years. Now retired Eric's special interest is in the 'Wisdom' books of the Old Testament he has completed two volumes on the Psalms and the volume on Proverbs in the Focus on the Bible Series.